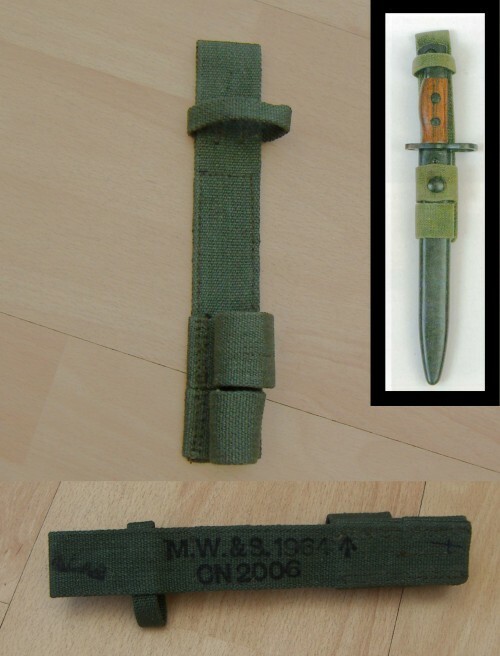 This dark green bayonet frog was for use in the jungle. Although it is stamped 1964, it is exactly the same design as was used in WW2. M.W.&S.LTD as stamped on the canvas, stands for ‘Michael Wright and Sons Ltd’. This particular item was ‘military surplus’. The markings would have soon worn off in active service. Please note that the top right photograph, indicating how the bayonette fits into the frog, is Copyright. M.Brayley. "British Web Equipment of the Two World Wars". Thank you to Martin for his kind permission to use the illustration.